Once you learn professional quality fabric dyeing methods you'll never look back on the same old colors available in stores. Knowing what dyes to use on which fabrics is the first step and the rest is just following a simple recipe! When I was pregnant with my first child, I became very bored with the traditional pastel pink and blue baby clothes that I'd see in stores. I'd find primary colors here and there (red, blue, yellow) but nothing interesting, no chocolate brown, periwinkle, burnt orange or grass green. In frustration, I did what any "make it myselfer" would do...I bought a few packs of plain white baby onesies and learned to dye them myself! For Cottons: - Not all dyes are created equal and this is especially true for dyeing cotton. Sure, you can buy a "drugstore" brand of dye in a little box and mix it up and dye a onesie or two. This will serve you well for lighter colors, but these dyes will fade over several washes and it is very hard to get vibrant colors. However, if you are trying out fabric dyeing for the very first time and the more professional methods intimidate you, then by all means give these a try! For true, vibrant colors that do not wash out, follow these cotton fabric dyeing instructions for fiber reactive dyes. I use this method to dye most baby clothing, since most is 100% cotton. Most of the baby shirts and onesies featured throughout this site were dyed this way. 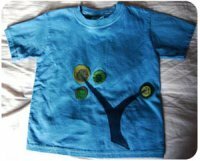 For Tye Dyeing: - You can tie dye baby clothes with the fiber reactive dye instructions above with the addition of some rubber bands. Or, even easier, try out one of the many tie dye kits or even the simple tie dye cords. For Silk - Did you know that silk can be dyed with plain old Kool-Aid and some vinegar? It is true! So simple and achieve surprisingly vibrant results. Food coloring also does the trick beautifully, as does a variety of acid dyes that you can purchase. The best part is that you can also dye silk with the fiber reactive dyes for cotton by simply adding vinegar to turn it into an acid dye. For Wool - Again, Kool-Aid works it's magic on wool, as do acid dyes and fiber reactive dyes with the addition of vinegar. The same dyes that work on silk work well on wool too because they are both made of protein fibers. You can easily dye your own wool yarn for one of a kind baby knitting projects! 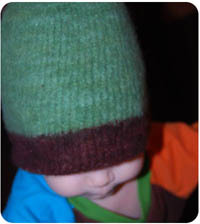 Other Fabrics - Most baby clothes are cotton, but you may run into other fabrics too. Nylon can be dyed with the same dyes as wool and silk. Rayon and hemp can be dyed using the same methods for dyeing cotton. However, polyester will not take dye. It wont! Even if you have something that is pure white polyester it will remain white. If it is a blend of polyester and other materials, then those other fibers may take up the dye which might create an interesting effect. Please note also that some threads on cotton clothes are polyester and will remain white after dyeing. I actually like the way this looks on baby onesies, but if you don't, be sure to buy blanks that have cotton thread. Whichever fabric dyeing method you choose to try out, please follow all instructions for safety and for goodness sakes, remember to wear gloves and old clothing! Too often I've walked around with purple hands for days because I thought I could just touch the fabric for a second and then wash the dye off. It stains fast! Say hello to a whole new world of colors for baby clothes and baby crafts! Back to the top of the Fabric Dyeing page.